Home Read Scorn: Victim of Shifting Backer Behavior, or Poor PR? Scorn: Victim of Shifting Backer Behavior, or Poor PR? [box type=”shadow” align=”alignright” width=”0″ ][iframe frameborder=”0″ height=”280″ scrolling=”no” src=”https://www.kickstarter.com/projects/571331118/scorn-episode-one/widget/card.html?v=2″ width=”220″][/iframe][/box][dropcap]T[/dropcap]he story of Scorn is a bit of an odd one. Back in June, an editor for the horror-focused video game site Rely on Horror was e-mailed H.R. 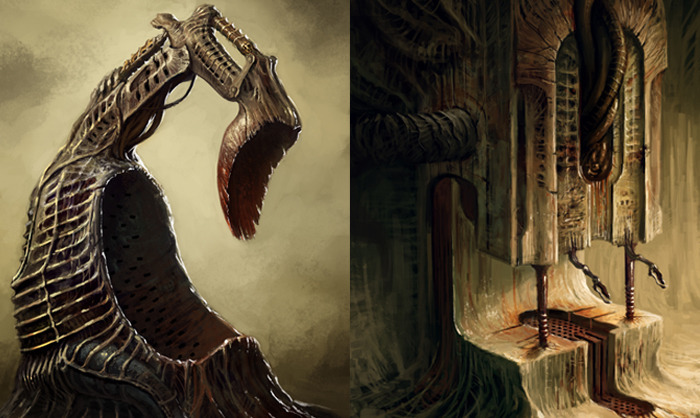 Giger-esque concept art with no explanation. About a month later, the source finally spoke up about what the images were and their intentions. 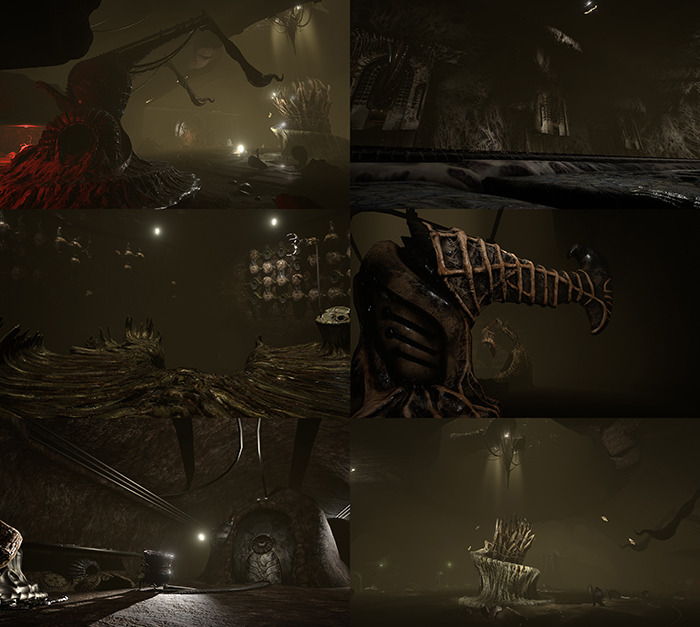 These images, along with some alpha game screenshots, were sent along as a means of gauging interest in a new indie horror title called Scorn. Ebb Software’s unique marketing move certainly turned heads, but only momentarily. Despite speaking with Sony and other companies, no one ever decided to fund and/or publish their game. According to Ebb Software, Scorn was routinely deemed “too risky” to pursue. Even in this incredibly hot horror and indie market right now they were one of the unlucky teams who were pushed aside. Although they never wished to come to Kickstarter they have finally launched a campaign. They do so with a few caveats: 1) Backers are not investors and 2) Backers will get no input or “fame” for providing their support. Although this might appear odd to some backers, there’s nothing at all wrong with a development studio keeping control over their product. In fact, more crowdfunding teams should follow that example when in pursuit of very specific game design goals. As for the whole “backers are not investors bit,” it has always been true and consumers who believe otherwise need to recognize the distinction. Liking or disliking final products is allowed and can’t always be predicted. With all that said, perhaps a distaste for Kickstarter in general has led Ebb Software to be ill-prepared for attempting to raise funds via the site. 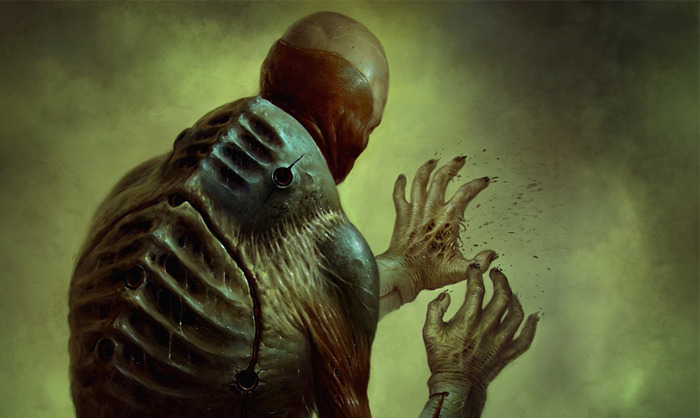 Their goal is a fairly hefty €200,000 (about $250,00) for the first episode of Scorn. Considering how many projects routinely underestimate development funds this is a perfectly suitable goal to shoot for… But Kickstarter has changed over the past few years. The very first video game project on the site, High Strangeness, had little to no information on the page but still saw itself fully funded. This provided a template for many projects – some far larger in scope – to receive immense backing without explaining much of anything. At that time, awesome concept art and ideas were all one needed. Now Kickstarter backers are becoming a far more questioning bunch. With dozens of campaigns launching weekly you simply can’t afford to back everything to a high degree. This year we’ve also seen many projects finally launch which has shown that sometimes awesome ideas don’t translate into great games. Many backers have been let down and some feel outright scared thanks to high profile campaign disasters. Kickstarter is not the “free money” train it once was. Savvy backers can be the greatest asset or death of any campaign so you must be prepared for them. As an outsider, it is incredibly hard to discern what Scorn is. Yes, it is a horror game (as easily evidenced by the dark, brooding art style). But what else is there to it? Descriptions of the game have always been quite cagey. Even in an interview with Rely on Horror there wasn’t much said about how it actually plays. The Kickstarter page gives a tiny glimpse of it, but still leaves things feeling incredibly obscure. Here’s the best I could sum up from the page as it currently stands: It’s an open world game, there is no HUD, items are limited, and there are puzzles. Despite there being an apparent focus on exploration and quiet world-based storytelling, there is also ammo. So, you’ll have to have shoot outs on occasion? I honestly don’t know. Given such a meager description Scorn doesn’t inspire funding. Instead it sounds like any number of Myst clones over the years. Obviously, its visual design is far creepier, but is that all there is to the project? No, of course not, or else Ebb Software wouldn’t continue pursuing development after being shot down by various publishers. But with this being the case, why the continued secrecy? Prospective backers, and even press, need to know what the heck this thing is about to fund and write about it. It is possible that a lack of succinct (and clear) pitch for Scorn is what caused publishers to back away? It would certainly make sense as smart companies and investors don’t like to gamble with their money. With all that said, it’s possible Scorn may still reach its goal despite never explaining what the heck goes on in game. For one, it (could) have Oculus Rift support and the Rift crowd is a very devoted bunch. It also has a fantastic aesthetic that even non-art buffs can readily appreciate. Thirdly, horror is still an immensely popular genre which many people back purely because they want more horror games. Still, ending the campaign in December 23rd sure doesn’t seem well planned. The holiday season is incredibly expensive and busy time for many. Some Kickstarters have received heavy pushes in the last few days, but that likely won’t be possible for this one. All developers who intend to pursue Kickstarter must recognize that the rules are changing. Unless you’re very lucky, providing little to no information on your game is a mark against the project. Backers have limited money and far too many campaigns to choose from. They will opt for titles which offer great descriptions, gameplay video, and maybe even a playable demo. Ebb Software, as well as every other development studio must not only explain – they must showcase their intense passion for the project they hope to create. Passion, more than anything else, is usually infectious to prospective backers. As of right now, Scorn’s Kickstarter page does not feel passionate or involved. It seems like a last ditch effort for a team who allowed publisher rejection to hinder their dreams. This title could very well become a monolithic game in the horror genre given the required time and money to prosper but it can’t get there without a proper marketing push. Kickstarter is effectively a marketing campaign and the first step to realize a developer’s dreams. I urge Ebb Software to reconsider or even rewrite their campaign to show the world just how much devotion they have for Scorn and this time truly explain what makes it special.